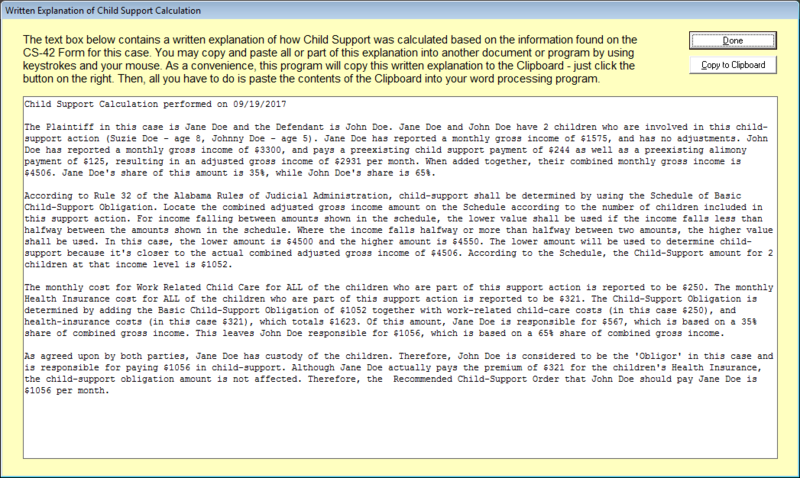 This software program automates the preparation of the Alabama Child Support Guidelines Worksheet. It performs all calculations and produces the worksheet as a printable PDF file. The annual subscription fee is $120 plus tax ($128.40). This software program is extremely easy to use! It draws the Form CS-42 on the screen and allows you to enter the information real-time. 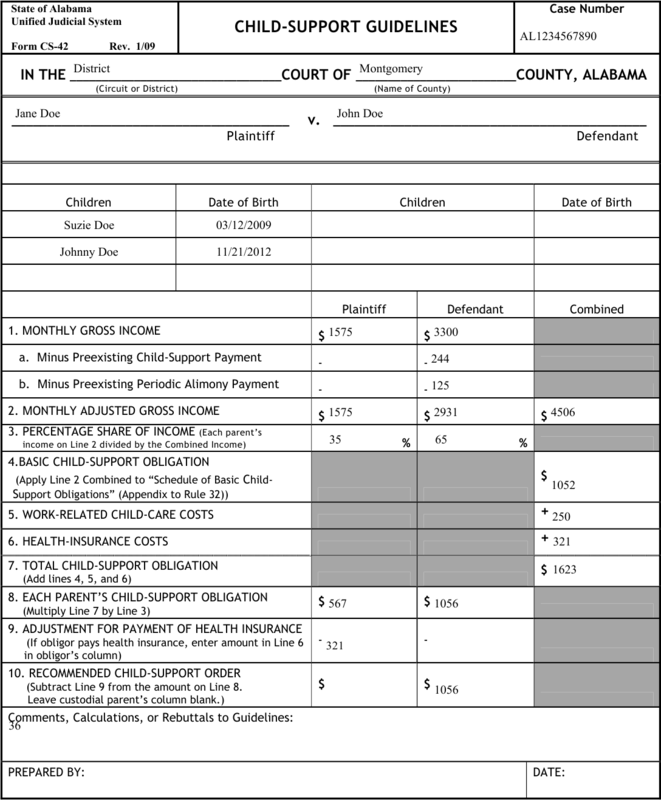 The Child Support calculation is performed each time you enter or change the information! You can try this software program for 1 month before making a longer commitment by clicking on the above "Add to Cart" button. The $10 fee is to cover our costs of mailing you a USB Thumb Drive containing the program, along with a registration number that will allow the program to work for 30 days. Your total cost for this one-month evaluation is $10 plus tax ($10.70). During trial period, you will have FULL use of this software and all of the features and benefits that it provides. To subscribe to this program for 1 full year, click on the above "Add to Cart" button. Your total cost for one year will be $120 plus tax ($128.40). We use PayPal to process all of our credit/debit transactions, because we know them to be safe and reliable. If you have any further questions, please contact us by clicking on the menu item at the top of this window labeled "Contact Us". Thanks for your interest! 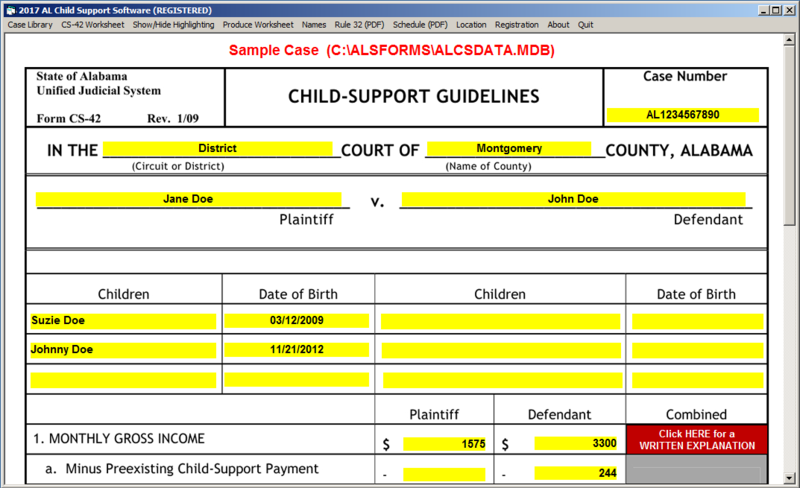 To subscribe to this program for 1 full year by mail, simply mail a check or money order payable to Advanced Legal Software in the amount of $128.40 (includes tax & handling) to P. O. Box 347, Carolina Beach, NC 28428. Be sure to note which software program and/or package you are ordering. We will mail you a USB Thumb Drive containing the programs you ordered, along with registration numbers. The fastest way to obtain this software program is to download it from this site. To do so, click on the Download button above this message. If you have security concerns about downloading programs to your computer, then you should use our "Try for 1 Month" option for $10 plus tax. We will mail you a USB Thumb Drive containing the program!